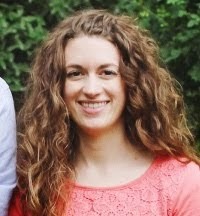 dresdencarrie: Super Bad Babies GIVEAWAY!! Have you checked out the awesome sponsor I have listed to the right? Super Bad Babies is a super cool stylish site for babies. Here are just a few things they have on their site. Have you heard this album? 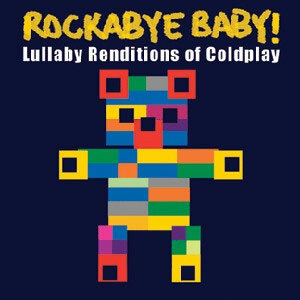 My niece has it and it is one of my favorite albums and I don't even have a baby, the songs are so sweet and mellow. There are other bands on there as well that have done a rock lullaby album, definitely worth the $! 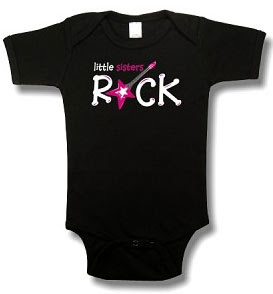 And super cute onesies for boys and girls. Check out their site for other fun gifts for babies and kids. 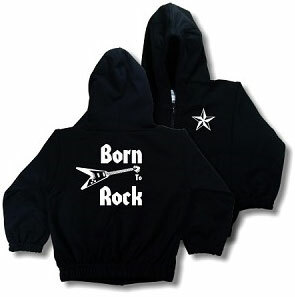 They have everything from gifts sets, silly pacifiers, CD's, onesies, hoodies, and bibs. Ready for the giveaway?!?! 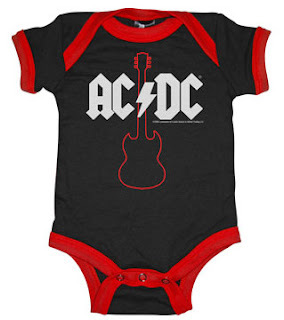 Super Bad Babies is giving away this super awesome AC/DC onesie. Regular price for this onesie is $24.99! Mandatory: Visit Super Bad Babies come back here and leave a comment telling me your favorite item in the store. Contest ends Saturday at midnight, tell your friends!